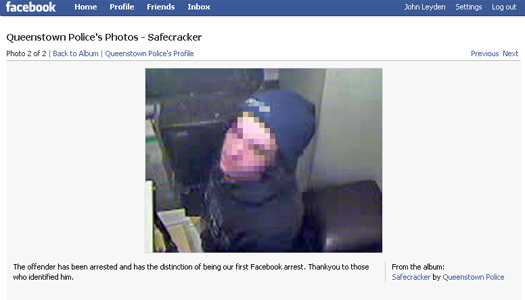 A failed safe-cracker has been cuffed after New Zealand police posted CCTV images of an attempted burglary on Facebook. CCTV cameras captured the hour-plus attempts of a man who attempted to prise open a safe at the Frankton Arms Tavern in the early hours of Monday morning. The man broke in through the ceiling of the bar before dismally failing to smash open the safe using only an angle grinder and a crowbar. It was hot work and the suspect foolishly took off the balaclava he was wearing, before he spotted the camera. He fled soon afterwards, leaving an estimated NZ$20,000 ($11,040) of weekend takings still safely locked in the safe. Local police posted images of the blagger on a crime-fighting page on Facebook, prompting a witness to come forward to name a suspect. Images of the break-in were also published through news websites and in newspapers but it was Facebook that did the business. Local police are describing the case as their "first Facebook arrest".